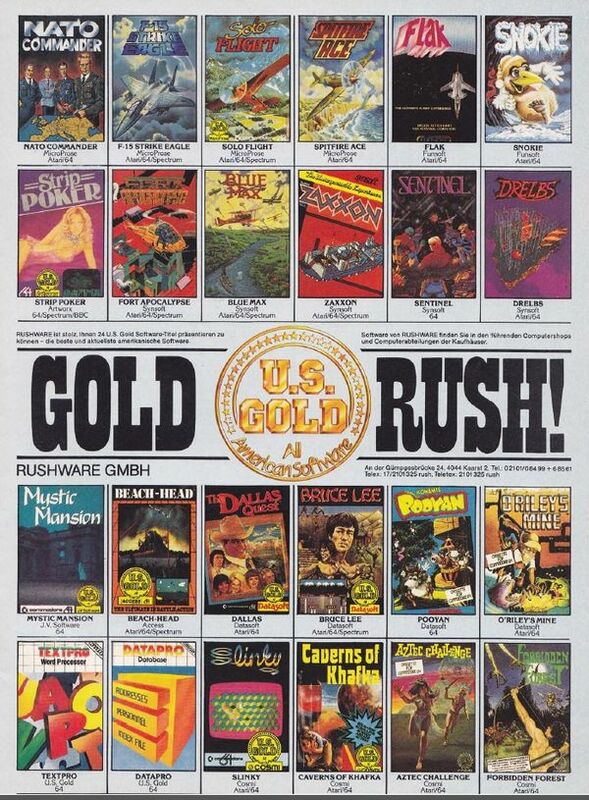 U.S. Gold was one of the most well-known publishers for the C64 in the 1980s. U.S. Gold was founded by Geoff Brown in Birmingham in 1984 as sales department of Centresoft. It was planned to mainly publish Atari and C64 games from the USA on the European market. Furthermore, U.S. Gold also converted many titles to other platforms and licenses were also another important part of their portfolio. In 1986 U.S. Gold secured the license for the soccer game for the World Cup in Mexico in 1986 for themselves. Although they had bought the license at time, U.S. Gold didn't manage to finish the game. However, U.S. Gold advertised broadly, that this game would offer pioneering innovations. Due to lack of time one bought the game World Cup Football by Artic Software. With changed graphics the title was published just in time for the Soccer World Cup 1986 as World Cup Carnival on the C64, CPC and Spectrum. Gamers, retailers and the press were aghast. The original game had already been four years old at the time of publishing! However, U.S. Gold tried to pitch their version of Artics World Cup Football pioneering version of a classic. Later, U.S. Gold had to bow to the critics and admit having made a mistake. Despite all this U.S. Gold got the FIFA license for the Soccer World Cups 1990 in Italy and 1994 in the USA. Until the 1990s, U.S. Gold could expand successfully, but with some distribution agreements they did not have the right touch. Especially a contract with Lucasfilm Games caused more costs than profit. To combine the energy, U.S. gold were pooled together as Centresoft Plc Group. At this point of time, U.S. Gold had two internal game developers, Silicon Dreams and Core Design. Silicon Dreams was founded by U.S. Gold while Core Design had been bought. This cooperation, however, did not last long: In 1996 they were taken over by Eidos, which made the name U.S. Gold disappear shortly after the takeover. The last title released under the logo of U.S. Gold was Atlanta 96. U.S. Gold took over the sale of the successful Epyx sports games of the "Games Series" in Europe. With this U.S. Gold proofed, that they could sell good sports games successfully. After the bankruptcy of Epyx in 1989 U.S. Gold began to establish a similar sports series and for this also bought licenses of the IOC. The game Olympic Gold, which had been published as the official game for the Olympic Games 1992 in Barcelona, was a success with the critics and also commercially. After that U.S. Gold could also get the license for the Olympic Winter Games 1994 in Lillehammer, as well as the Olympic Games 1996 in Atlanta. The titles that followed were not successful neither with the critics nor with the customers. The datasette versions by U.S. Gold on the C64 had one peculiarity: while the game loaded and a loading screens was shown, 3 tunes were playing again and again until the game had finished loading. They were the well-known music pieces: The Star-Spangled Banner (hymn of the USA), Yankee Doodle, and Dixie. With this U.S. Gold underlined that it sells the choice brand software from the USA. While the music played, a countdown was displayed, which showed how many 256-byte blocks still need to be loaded before the game was finally loaded. Additionally, there was a scrolling text, which informed the player about further U.S. Gold titles. The most well-known is probably Synsoft, which is today wrongly equalled with Synapse Software. Hidden behind Synsoft is nothing else than a label under which exclusively games of the company Synapse Software were sold in Europe. This page was last modified on 22 February 2016, at 03:36.